Notes on non-nominal systems: Toilet Tank: Tank was particularly filled up during purge and caused all crew to have to move upstairs for duration of purge. Workaround is to purge every other day of ops (e.g Sol 4 is next purge) to make upkeep easier on all. We also request a resupply of the TB-Cide Quat Cleaner Deordorizer/Disinfectant. We are out after the last purge. Water (Static): Water is at 50 Gallons which is alarmingly low. Our trailer water is at 1000 gallons but we need the means to transfer the water. Request to get Trailer water moved to Static water or permission and high level instructions to do it ourselves. Solar— SOC % (Before generator is run at night) Not nightfall as of submission, but will report this info in the next report. Propane – Did not check (No EVA), assume to be 79 percent volume due to past readings and trends. Summary of internet: Still good so far. Summary of Hab operations: Static Water Tank almost empty, need means to transfer Trailer water over to Static. Questions, concerns and requests to Mission Support: Is there a way we can check to see how much internet we are using during the day? We tried the link provided in a different log template but it didn’t take us to anything. Crew 184 is made up of highly qualified scientists, engineers, medical and journalist professionals. They are planning on undertaking several research projects at the Mars Desert Research Station (MDRS). The overriding goal of our mission is to simulate a Martian surface stay as closely as possible while at MDRS. Thanks to the crew’s wide range of expertise, they will be able to work on multiple scientific projects and experiments and explore the Martian analog environment. The crew is hoping to help enable the future settlement on Mars through their work during and after the mission at MDRS. The main research tasks are explained below. Fatigue management is an important mission objective for Mars exploration. This study will investigate fatigue and sleep in Mars Desert Research Station (MDRS) participants. An important goal for National Aeronautics and Space Administration (NASA) is to mitigate fatigue in human systems according to the 2005 NASA technology road maps. For example, we need an effective measurement of sleep time, quality, and efficiency. We need an effective surveillance examination for fatigue (psychomotor testing for fatigue). The Mars Desert Research Station is an ideal place to test these objective and subjective tests. It is also a safer and cost efficient way to test countermeasures for a potential Mars mission. MDRS’s isolated location allows for minimal outside interference. Crews can control their sleep time to a comparable Martian day of 24 hours, 40 minutes. Time Delay: Conducting operations with a significant time delay is a major impediment to ground / flight crew coordination and is something that real-world space programs have little experience with concerning a human crew. 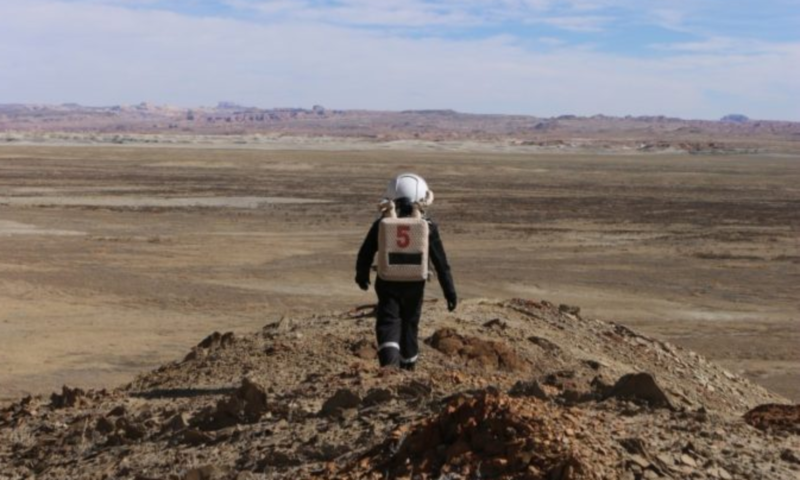 MDRS is an ideal location to simulate a martian time delay to exercise communication techniques between ground team / flight crew to ensure efficient operations. We have numerous tool and building kits that will be used to build simulated parts and structures. A ‘ground team’ will be simulated in the HAB while a ‘flight team’ will work in the Science Dome. We will experiment with different time delay durations and different methods of information transfer between teams. When executing directed tasks the time to completion and other measures of efficiency will be recorded to determine analytically the most efficient method of communication under different time delay conditions. Evaluating the past habitability of Mars is a key science objective for the near future. Meeting this goal will involve innovation, exploration, and scientific enquiry across all levels of observation from orbital, lander, and rover — the most advanced being NASA’s current Mars Science Laboratory rover Curiosity — and eventually to a human mission. At the MDRS, features analogous to those on Mars can be fully characterised. Dunes and channel structures provide a test-bed for investigation of the geomorphological bodies found in martian terrains (e.g. Clarke & Pain, 2003; Malin & Edgett, 2000).In this proposal, we highlight the value of using four modes of geologic survey operating at increasingly fine scales. Analogous to the gradual down-scaling of a Matryoshka (Russian) doll, the four-phase sequence of study provides observations at a progressively smaller scale. Long duration space missions will require light weight and straight forward methods for anesthesia. The technique must be applicable in both zero-gravity and low gravity situations. [ Komorowski M. 2016, Sczepaniak J 2016] As the crew travels to Mars it will experience a 15 minute communication delay with the Earth based mission control center. [Otto C. 2010]. Therefore, the crew will need to perform anesthesia with minimal guidance. A mission to Mars will last longer than one year and may result in issues with procedural retention by the crew medical officers. Nerve block techniques are ideal for many medical/surgical procedures. They require minimal up mass and are less bulky than other techniques. Additionally, they have a lower chance of hypotension. They do not require intubation in all cases. [Komorowski M. 2016] The two most challenging parts of a nerve block include identification of the anatomy using ultrasound and inserting the needle to the target area. Schedule: In order to maintain conditions as flightlike as possible we are working with a volunteer organization, Space Generation Advisory Council, to do our scheduling for us. Prior to the mission our crew drafted a list of all activities we wanted to complete during the mission with details such as number of crew, length of activity, duration of activity, scheduling constraints, etc . . With this information SGAC creates and sends us a schedule at ~ 2pm every day for our next day. This allows us to experience missions as astronauts do when we are not in charge of the details of our own schedule. We will be monitoring crew performance while executing these schedules and provide daily feedback to SGAC to modify schedules for future days. Exercise: It is important to maintain bone density and muscle strength under micro-G / reduced-G. To simulate this we have brought weights and a bike machine to MDRS that closely simulate the exercise routine astronauts go through on the International Space Station. Every crewmember is scheduled for exercise every day. Filming: Our crew journalist will be filming our entire experience at MDRS and will use it to promote space and public outreach encouraging space exploration throughout the wider public. During our stay we will be conducting numerous interviews, both individually and as a group, to document our stay. Summary Title: Getting settled at MDRS! Mission Status: Today has been a busy day preparing both ourselves and the MDRS for the rest of our mission. We spoiled ourselves with a hearty breakfast today (and to get rid of some of our fresh food!). Today has been one of excitement preparing for our first EVA tomorrow. We have encountered our first mission failure! During the high winds today we heard a bang as the outer airlock door was blown open. The inner airlock door held closed and thus we didn’t all die! We immediately closed the door to the EVA Prep room to form a second seal to the martian atmosphere. During tomorrows familiarization EVA we will enter the EVA Prep room, close the EVA Prep room door, and use that as a depressurization chamber. Immediately upon departure on tomorrows EVA we will repair the outer airlock door. We have discovered today that all the planning in the world still requires real-time flexibility as numerous activities took much longer than we expected. For example the Exercise Bike took several hours and modifications to assemble and get working correctly, much more than we had allocated. That being said, we have successfully completed all objectives and are ready to begin completing our science objectives tomorrow!. 6. Medical status surveys with Crew Doctor throughout the day. See schedule for tomorrow attached to this email. 11. EVA Airlock Outer Hatch Failure (failed open) due to high winds. Weather: Very windy! We have had two wind related MDRS failures. Crew Physical Status: All crew in good health. 1. We can’t find a template for Daily HSO Report. Please provide what is desired in this report. 4. Recommendation for wi-fi router failure. a. We have reset the router, checked our allocation, restarted laptop, and router is non-functional. When hooking up laptop directly to modem internet works well.